Home / Victrola Coffee Roasters / Surprising Guatemala with sage, brown butter and lime, try it! Surprising Guatemala with sage, brown butter and lime, try it! Serendipity: (noun) the faculty or phenomenon of finding valuable or agreeable things not sought for- Mirriam Webster Dictionary , an example: our Guatemala Acatenango- La Joya. From our first cupping we were delighted and surprised. When approaching a coffee from Guatemala, I usually expect a pleasantly acidic, medium-bodied coffee with milky flavors, maybe some orange or tangerine and cocoa. Ah, but the La Joya is different. First, the rich, creamy mouth feel ushers in a savory mix of browned butter and sage. This delicious pairing is accented by a tart lime-like acidity. Not surprisingly, this coffee was grown with care in near ideal conditions. Nestled high on the steep slopes of the volcanic Acatenango the La Joya farm is surrounded by lush virgin forests filled with abundant wildlife. 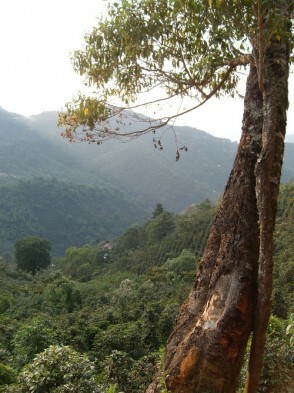 The coffee is protected from the bright sun and gusty wind by Gravilia and native shade trees. Try it for yourself. Available in all of our cafes or online.